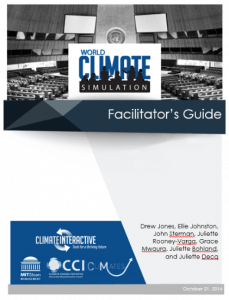 With thousands worldwide using the World Climate simulation materials we decided that it was time for a makeover. 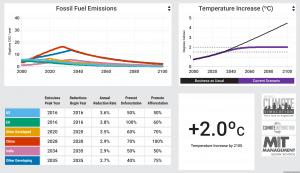 Over the last few months we have been working to get you newly redesigned materials for World Climate and the final batch is here. You may have already noticed that World Climate now has its own logo. Now the whole World Climate visual identity has been refreshed. You can find all the new materials in English and French with the newly refined design. Updated materials coming soon in Spanish, German, and Dutch. Older versions of materials in Farsi, Japanese, Mandarin Chinese, Norwegian, and Portuguese still available. Check the briefings containing clear graphs and well balanced text information. Look at the updated version of the slides. Flip through the facilitator guide.